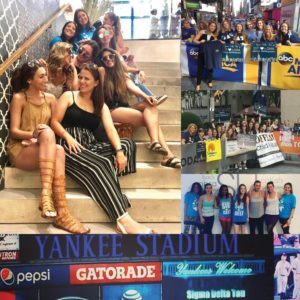 SDT welcomed collegians and alumnae who came to NYC early and those who live locally to participate in a variety of programs. They kicked off the morning with visits to the Today Show and Good Morning America. The rest of the day, groups gathered to enjoy a tour of Soho/Flatiron, dined out, participated in fitness classes and attended a Yankees game. The Centennial Celebration officially kicked off with the opening of the SDT Museum, an interactive display of 100 years of SDT history. It included historical tributes to our seven Founders, the Alpha chapter, all National Presidents, SDT philanthropic activities, the Torch magazine, and an amazing collection of artifacts in our “Hall of Chapters.” Attendees then gathered for the “Celebrating Our Founders Party” on Friday evening. Among the highlights included our 11 Past National Presidents honoring our National Founders, a tribute to National Founders by their relatives, a look at the Alpha Chapter at Cornell University as it is today by Chapter President, Amanda Goffner, and finally the presentation of the 2017 Outstanding Alumna Award to Edith Lederer, Alpha-Cornell (1964). The evening wrapped up with a comedy show. Saturday morning, Sig Delts went to work for SDT Gives Back. A group of women wrote letters to service men and women and made teddy bears for their children. Another group participated in Partnership for Parks, cleaning and beautifying Theodore Roosevelt Park in NYC. Some women chose to sweat it out in fitness classes and ran personal fundraisers. Another group visited a JWI women’s shelter, delivering backpacks and children’s books to complete the SDT sponsored children’s library. The afternoon programs including a Philanthropy Celebration featuring Prevent Child Abuse America, Jewish Women International and the SDT Foundation, and then the Empowering Women Panel with seven outstanding alumnae. 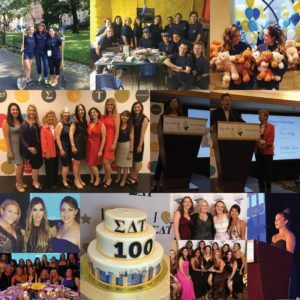 That evening, SDT hosted the Centennial Gala, featuring Siggy Flicker (of Housewives of New Jersey) as our MC, Olympic gymnastics medalist, Aly Raisman as our Keynote Speaker, and The Touchtones, Cornell’s Premier Acapella group. 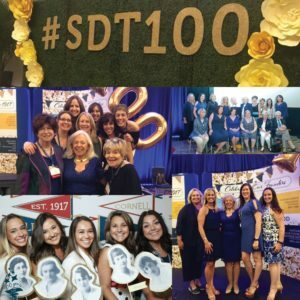 A highlight was the sentimental video that captured 100 years of SDT history. National President, Debbie Eleftheriou, announced the year’s National Award recipients, and then the evening concluded with a dance party. The Centennial Celebration came to a close with the Sisterhood Brunch at the Hard Rock Cafe in Times Square. A heartfelt invocation was given by Dora Bloom Turteltaub’s daughter and granddaughters. National Volunteer Awards were presented, including the Sigma Delta Tau Achievement Award to Beth Gruber. 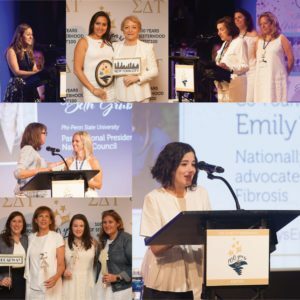 Keynote speaker, Emily Kramer-Golinkoff, shared her story and welcomed the audience to be part of Emily’s Entourage in the fight for a cure for Cystic Fibrosis. Beth Gruber, Centennial Chairman, provided closing remarks and welcomed everyone to attend the initiation ritual to welcome 49 honorary initiates into the SDT sisterhood.